The new old Pabst Brewery. Photo by Jeramey Jannene. 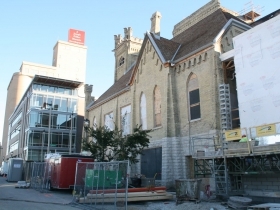 The former First German Methodist Church at The Brewery might be the smallest historic building being preserved at the complex, but symbolically it might mean the most. 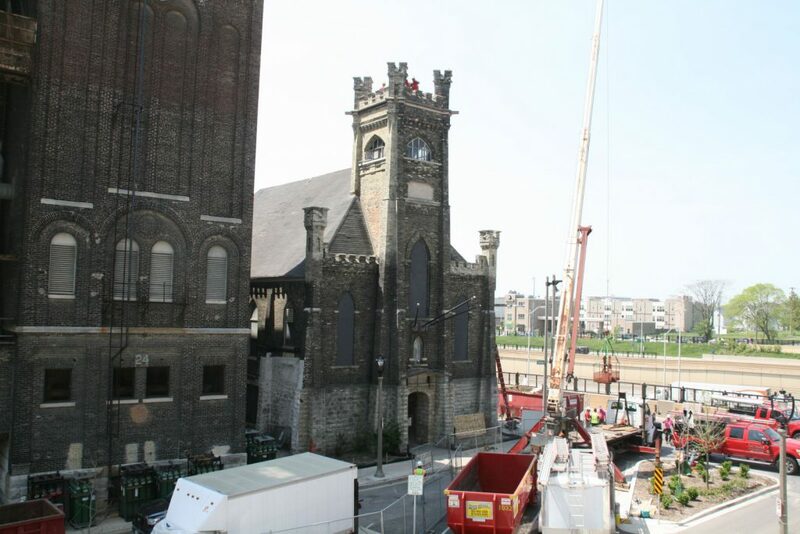 Located at 1037 W. Jueanu Ave., the one-time church is the final historic structure being redeveloped as part of Zilber Ltd.’s massive redevelopment of the former Pabst Brewing Complex. 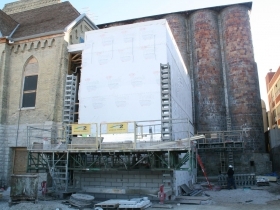 It also brings things back to where they began for its new tenant, the Pabst Brewing Company. 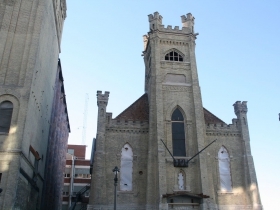 Pabst is opening a new micro brewery, tasting room and restaurant in the former church. According to Pabst Chairman and CEO Eugene Kashper, the company will initially brew approximately 2,000 barrels a year at the facility consisting mostly of long-forgotten Pabst recipes. 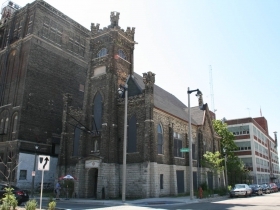 Design on the $5 million adaptive reuse project is being led by Engberg Anderson. Work includes the repair of windows, cleaning of Cream City brick walls, installation of a new roof and a two-story rear addition. 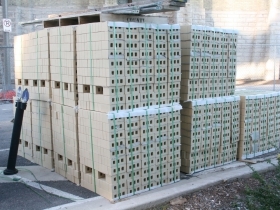 An outdoor beer garden will be constructed on the south and east sides of the block. Pabst will lease the building from Blue Ribbon Management, a development firm specializing in EB-5 financing that allows foreign nationals to obtain green cards for investing in job-creating projects. 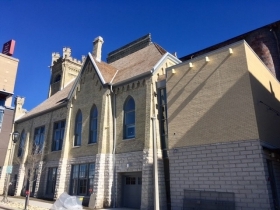 Brewing is expected to begin in March with a grand opening planned for May. 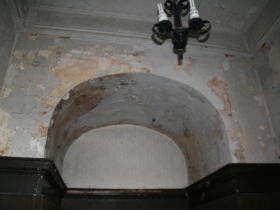 The project was originally intended to open in summer 2016. 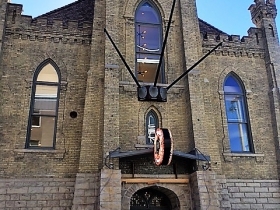 The church-turned-brewery was originally completed in 1873, according to city records, and is the second-oldest building in the complex. 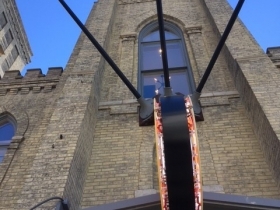 The Victorian Gothic building is perhaps better known by Milwaukeeans as the former Forst Keller Restaurant. 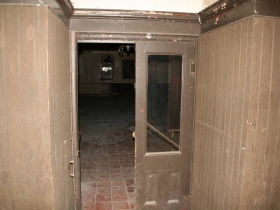 Pabst also used the building, known in company documents as Building 23, as a training facility. 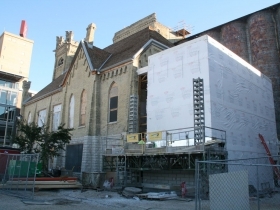 When we last covered the project in October crews were on-hand working on the rear addition to the building. For more information on the project’s origin and Zilber’s redevelopment of the complex, see my 2015 column covering the project’s announcement. Pabst, under a previous ownership group, abruptly shuttered the brewery in 1996, locking out employees and creating a black hole on the edge of Downtown. 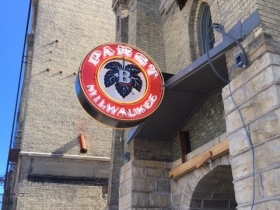 The abrupt closure caused many Milwaukeeans, including Mayor Tom Barrett and area Alderman Robert Bauman, to quit drinking the “blue ribbon” beer, as its ads long touted it. The multi-block complex sat empty for years until Jim Haertel put it under contract for purchase on September 11th, 2001. Haertel today operates a tavern and hall in the former visitor center and the rest of the brewery was ultimately purchased by real estate giant Joseph Zilber. Zilber’s namesake firm has done the heavy lifting of redeveloping the rest of the complex. The new ownership team at Pabst is well aware of the company’s complicated history with Milwaukee. 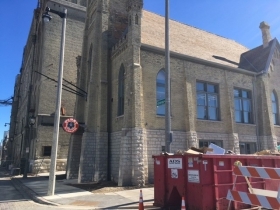 At a 2015 event announcing the project Kashper said that the project is the first step in Pabst becoming a good citizen and part of Milwaukee. It’s no secret that Pabst (along with Schlitz, Blatz and a number of other brands) have all been brewed on contract by MillerCoors for years. 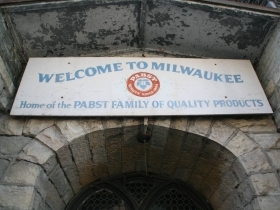 In fact, if you take a tour of Miller’s flagship Milwaukee brewery you have good odds of seeing Pabst products moving down the assembly line. That’s not going to change anytime soon. At the new brewery Pabst will be making micro-brews from its historical archives of more than 50, long-unused recipes. The company will still maintain its headquarters in Los Angeles for the time being. It has been located there since the Metropoulos family bought the company from the Kalmanovitz Charitable Foundation in 2010. Kaspher and TSG Consumer Partners, a private equity firm, acquired the brewing giant in November 2014. The new brewery will be the only facility where Pabst itself brews its own beer; the rest is all brewed on contract. Andeker. Please revive this brand. It used Czech hops even in the Commie days. It was Pabst’s premium brand. 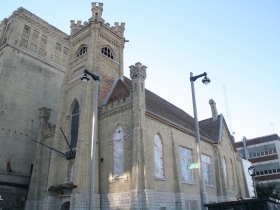 I was a member of the Milwaukee Liederkranz, a German-American maennerchor, for 30 years, and the older guys told me of the fun times they had in the 1950s in the Forst Keller. 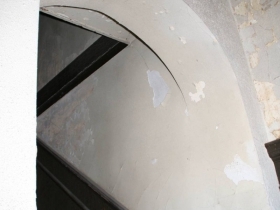 They held their rehearsal upstairs in the old church and then, after rehearsal, went down to the bar to have a few beers. The other customers would ask them to sing favorite beer drinking songs and so some of them would stay and driink longer than they planned. 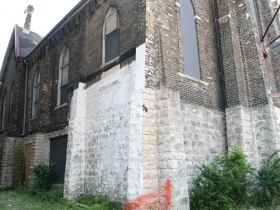 I really wish Urban Milwaukee had a better photo gallery plugin. I loved going to the Forst Keller in the mid-60s. Adi Binder was a skiing friend and his mother was the main cook at the restaurant in those days. The Binder family was from Austria and the food was always wonderful! We had lots of good times there. $1 perch fish fries, 10 cent beers…..but DO NOT touch any of the chess pieces on the tables…circa 1961…a favorite haunt of the Chem grad students at MU.